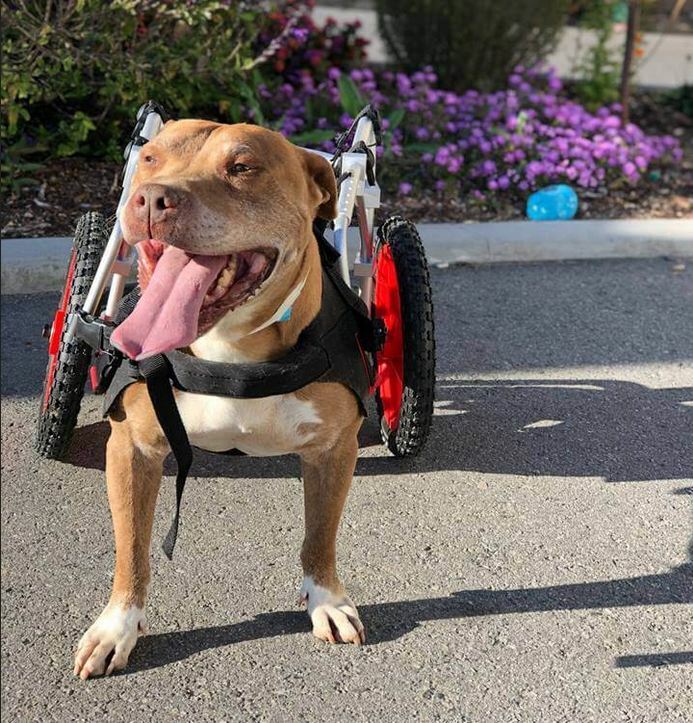 A great deal of attention, and concern, has been focused on a homeless California shelter dog who was recently photographed in a wheelchair. The dog, dubbed Blake aka Scooter, is at the Riverside County Animal Control agency and many people are worried that he will be put down. On Wednesday, the Riverside County Animal Services facility issued a news release about the eight-year-old dog, and his current status. According to the animal welfare agency, the facility’s phones have been “blown up” by people calling in to check on his status. And, some people have established unauthorized online fundraisers to “save” him. Animal Services is not associated with that account or any “pledge drives” seeking money for Scooter. The shelter staff is working to find someone experienced with caring for a special needs dog. “He easily warmed our hearts and we wanted to do everything in our power to save him,” said Jennifer Millard, a senior animal care technician who works closely with rescue group partners. For now, Animal Services is interested in speaking with individuals who have some level of experience with special-needs animals. Please do not call. E-mail Animal Services at shelterinfo@rivco.org and please put SCOOTER ADOPTER in the subject line. An appointment will be scheduled with prospective adopters. Note: It should be noted that the wheelchair Scooter is currently using may need to be replaced by a custom-fit model.